Our story opens with two pairs of shoes (one two-toned, one staid brown loafers) emerging from two separate cabs, walking separately to catch a train and their date with destiny, as we cut to two separate train tracks merging together. 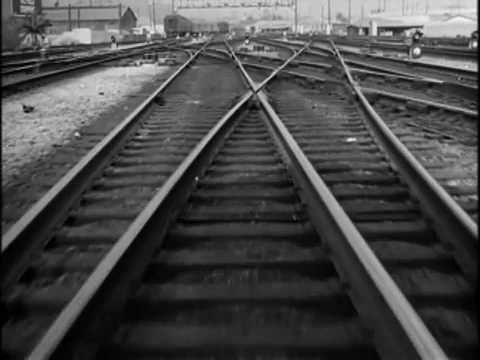 Hitchcock’s playing with one of his classic themes: “the double”, or more importantly, duality. Even Dimitri Tiomkin’s score highlights the differences, as a jaunty air plays with the brown shoes, while the two-tones take on a more ominous tone. This musical “double” will be featured throughout the film, and I think it’s among the composer’s best. Hitchcock pulls out all the stops in this most entertaining movie, with all the familiar Hitchcock tropes present, including the director’s cameo (carrying a bull fiddle onto the train… also known as a “double” bass). But what stands out most is the theme of duality, as Guy Haines plays Yin to Bruno Antony’s Yang. 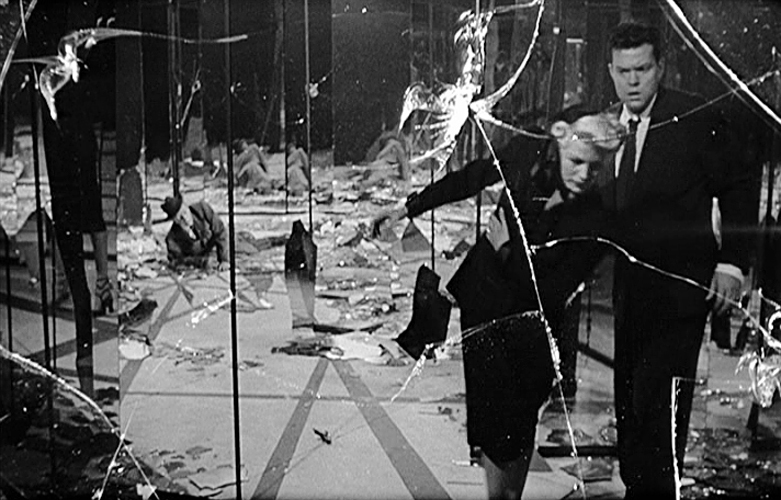 Not just Tiomkin’s score, but the fine cinematography by Robert Burks, making his first of twelve pictures with Hitch, eloquently captures the contrast between the two personalities. 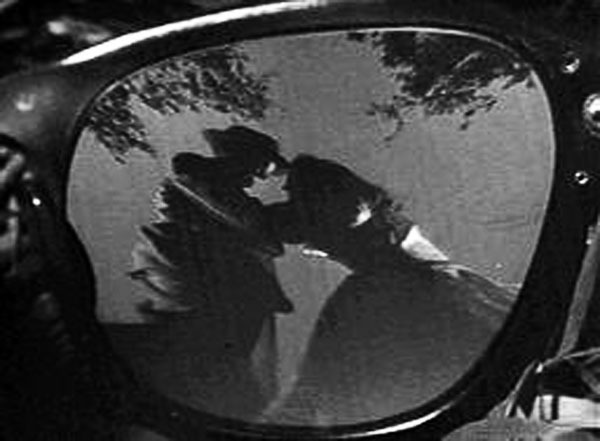 There’s also that famous shot of Miriam’s murder, reflected back to the audience in her fallen eyeglasses; the tennis match with spectators’ head moving to and fro to follow the ball, all except Bruno, who only has eyes for Guy; the contrast of Guy’s grueling match at Forest Hills with Bruno desperately trying to retrieve Guy’s cigarette lighter (the film’s McGuffin) from a sewer grate; and that dazzling finale back at the amusement park, with the most terrifying Merry-Go-Round ride ever (although that little boy sure seems to be enjoying himself! )… all this and more add up to a film the word “classic” was certainly coined for! 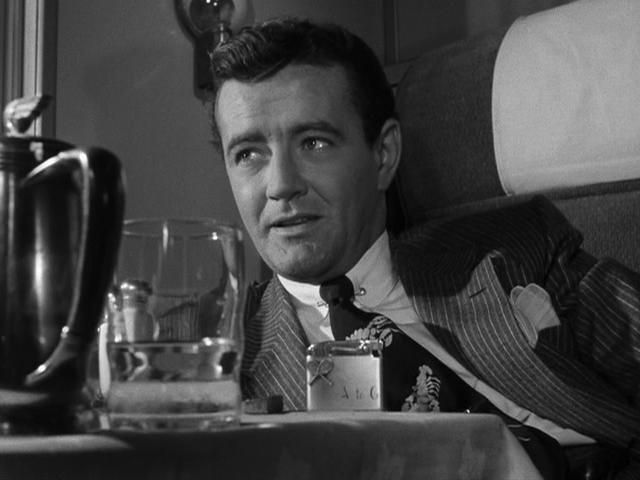 Speaking of terrifying, Robert Walker’s Bruno is one of the most cold and clever villains in history. Flamboyant, glib, yet that impish grin can’t quite mask the madness behind his eyes. 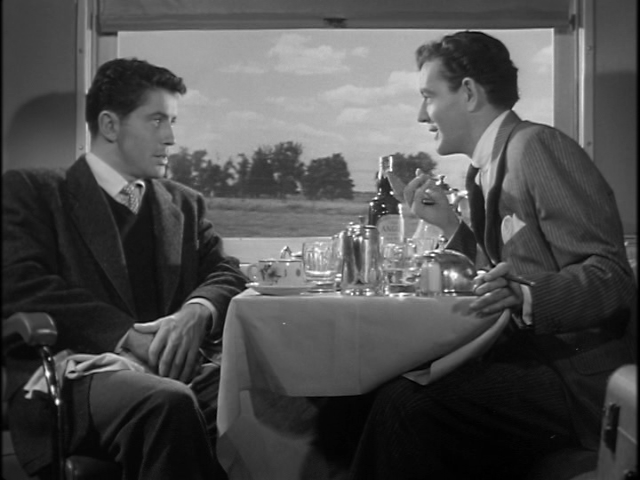 Bruno is obviously a gay man, or at least it’s implied, though the film doesn’t come out and say it (being 1951 and all), but it’s pretty clear he’d like to do more than swap murders with Guy, yet his feelings, like the murder, go unreciprocated. Doted on by his loving mother, who he treats with contempt, Bruno is a psycho’s psycho, showing no remorse whatsoever for his actions. That moment when Bruno pops a child’s balloon with his lit cigarette says more about him than mere words could convey. Like all sociopaths, Bruno is an accomplished liar, and will stop at nothing to get his own way. 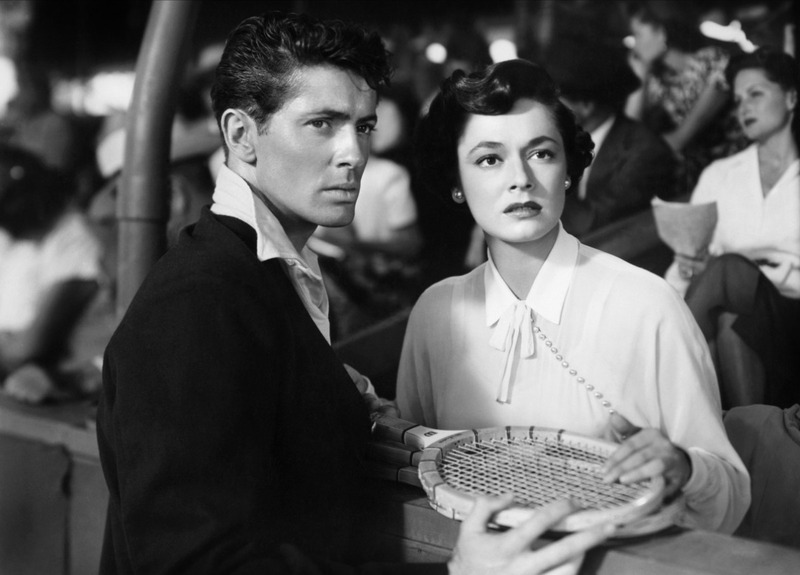 Whether casually discussing the art of murder with two dowagers at a D.C. cocktail party, or frantically fishing that lighter out of the sewer, Walker paints a devastatingly stunning portrait of a sociopath, and gives undoubtedly his best screen performance (which would sadly be his next to last – he died shortly after the film’s release at age 32). 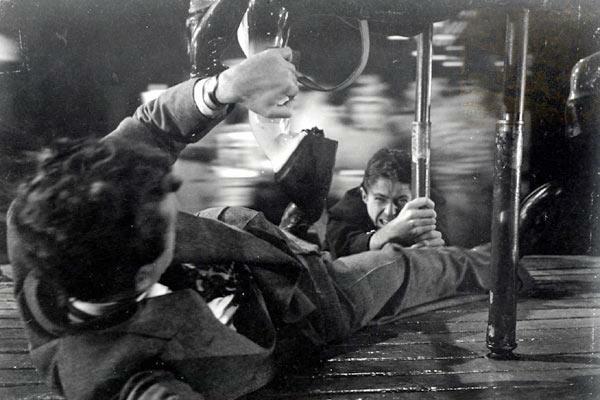 Farley Granger is equally good as Guy, trapped in Bruno’s mad web. Granger has previously played a killer in Hitchcock’s ROPE, and this time he’s the victim of Bruno’s deranged scheme. Ruth Roman is Anne, Granger’s love interest, Patricia Hitchcock (the director’s daughter) is likeable as younger sister Babs, and Leo G. Carroll (participant in six Hitchcock films) is their dad, Senator Morton. John Doucette and Robert Gist are two cops assigned to watch Guy, and a pair of ladies from TV’s BEWITCHED are on hand: Marion Lorne (Aunt Clara!) plays Bruno’s adoring mother, and Kasey Rogers (billed as Laura Elliot),the second Louise Tate, is the unfortunate Miriam. The screenplay credits Raymond Chandler as cowriter with Czenzi Ormonde, but this isn’t entirely true. Chandler was initially hired, and after two drafts left the project, or to put it bluntly was fired. The Master of Hard-Boiled Fiction and The Master of Suspense did not get along, and allegedly Hitchcock ceremoniously held up Chandler’s script and, holding his nose with the other hand, dropped it in the wastebasket! Both men agreed Chandler should not get screen credit, but the studio wanted the prestige of Chandler’s name attached, so there it remained. I could go on and on writing about STRANGERS ON A TRAIN, and have plenty of notes to do so, but you’ll have a much better time watching it than reading my scribblings. If you haven’t seen this masterpiece, do so ASAP. And if you already have… watch it again! It just gets better and better as time goes on. Saw it and liked it very much! I agree but Vertigo will always be my favorite! Such a spine tingling work! This is one of Hitch’s best films! I’d just like to mention that when discussing screenplay adaptations, we should always cite the author of the source material. In this case, it was adapted from Patricia Highsmith’s wonderful novel. You’re right, I omitted Ms. Highsmith’s name. Like I said, there’s just SO much material to cover in this film! I did a review of this film last year not long after our TCM Hitchcock class. For me the entire film was made by Robert Walker. What a performance. Brilliant film. Robert Walker dominates this film and makes for an unforgettable and creepy villain. Such a shame he died so young. Yes, he could have had a whole new career as a villain after this film. Next PostNext Halloween Havoc Is ‘Universal’ This Year!